Gravesend office: 24 Wrotham Road, Gravesend, Kent DA11 0PA. From London A2/Dartford – coast bound. From the Dartford Tunnel take the A2 exit signposted London/Canterbury/M2, keep right and continue on to the A2 signposted Canterbury. After approximately five and a half miles take the Wrotham/Gravesend exit A227, at the first roundabout take the first exit, continue over the next roundabout and stay on the A227 for approximately one mile heading in towards Gravesend Town Centre. Stantons’ offices are on your left hand side just past Zion Place and directly next door to the Gravesend Masonic Hall. From Dover – London bound. Follow directions and signs for London M2, join the A2 at Cobham for London, continue on the A2 and take the exit for Wrotham/Gravesend A227. At the roundabout, take the third exit onto A227/Wrotham Road. Go straight over the next two roundabouts and continue on, staying on the Wrotham Road for approximately one mile. 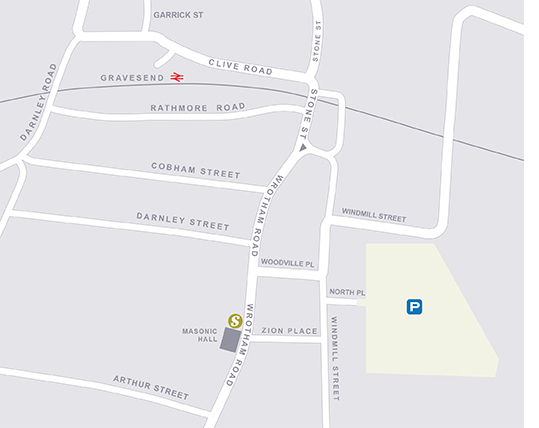 Stantons is on your left hand side just past Zion Place and directly next door to the Gravesend Masonic Hall. 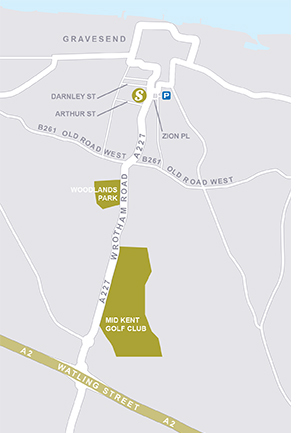 We do not have car parking facilities at our offices but there is a large public car park (signposted ‘Parking for Woodville Halls’), accessed by taking the turning on the right (Zion Place) immediately before our offices then turning left and immediately right. Approx 25 minutes from London St Pancras into Gravesend railway station. Approximately one hour from London Charing Cross into Gravesend railway station. Approximately one hour from South Eastern Coastal Regions into Gravesend railway station. From Ashford/Canterbury travel to Ebbsfleet International railway station where you will need to change platforms for all stations to Gravesend railway station. Alternatively there is a Bus Service No. 499 which runs approximately every 15 minutes from Ebbsfleet International railway station into Gravesend town centre (Garrick Street, Bus Station Stop B/Gravesend railway station). This takes approximately 20 minutes. From Gravesend railway station/bus station it is a very short five-minute walk to our offices. From outside Gravesend railway station/Garrick Street bus station walk up to the top of Clive Road and follow the footpath round as it bends to the right and then continue on the same side of the footpath for about 0.3 miles and Stantons’ office can be found on the right hand side next to the Gravesend Masonic Hall.